Aluminum oxide discs, premium aluminum oxide, silicon carbide discs, zirconia alumina discs, sander discs, sanding discs, grinding discs, abrasive discs, resin fiber discs, and resin fibre discs. Abrasive discs for all applications. From general purpose light grinding, to heavy stock removal of marble and cast polymers. Finer grits are available. Disc holders for these discs are listed on our Pads for discs with center holes page. 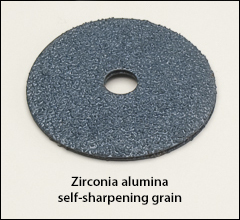 Additional abrasive discs are shown on our Discs page. WARNING: Proposition 65 Label for all resin fiber discs shown below, except the silicon carbide discs. General purpose aluminum oxide resin fiber discs. Aluminum oxide abrasive resin bonded to a heavy fiber backing for strength and tear resistance. Discs contain no halogen producing grinding additives. Sold by the pack, 25/pack. aluminum oxide resin fiber discs. Deliver optimum value when used for high stock removal and where cool cutting action is required. Blend of advanced abrasive alloys and bonding agents deliver superior cutting rates and longer useful life. Sold by the pack, 25/pack. The preferred grain for use with fiberglass and composites. A resin fiber disc with extremely hard, sharp grit for cool cutting and fast stock removal. Sold by the pack, 25/pack. Extra tough resin fiber discs for heavy stock removal and long life. Aggressive but cool cutting. Also available in 50 and 80 grit. Sold by the pack, 25/pack.